Amir Khan continues his comeback trek on Sept. 8 against Samuel Vargas in Birmingham. Khan, the lightning-fast fighter from the UK with complementary long arms and world title credentials, reportedly hopes another solid performance will lead to securing another mega fight, this time against either fellow UK standout Kell Brook or the winner of July 14’s battle between Manny Pacquiao and Lucas Matthysse. With a long-awaited fight between heavyweights Anthony Joshua and Deontay Wilder on the ropes, Khan's progress is capturing the attention of the boxing world. Khan (32-4, 20 KOs) defeated journeyman welterweight Phil Lo Greco in a 39-second brief but violent romp in April. Khan dominated Lo Greco from the opening second of the fight, throwing fast and furious combinations to knock Lo Greco down twice before the referee halted the bout. It was Khan’s first action since jumping up two weight classes only to suffer a thunderous knockout loss to Canelo Alvarez in May 2016. For Khan, facing Vargas is a decent step toward bigger fights. The 29-year-old Colombian isn’t an elite welterweight title contender himself, but is expected to present Khan with a sterner test than Lo Greco did earlier this year. 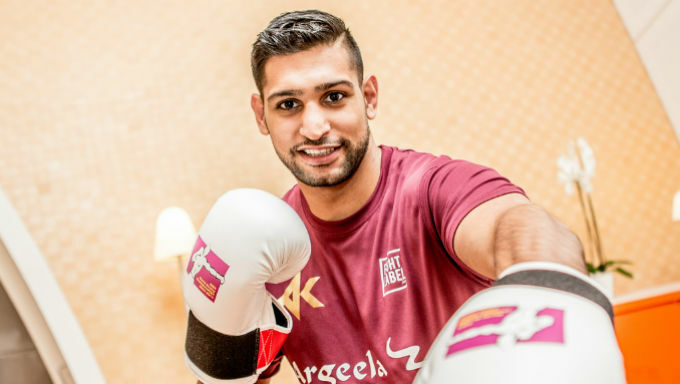 If Khan hopes to secure bouts against other top level boxers in the near future, he probably wants to get more ring work in beforehand than he did with Lo Greco. Vargas has twice been in the ring with world class welterweights, suffering knockout losses to both Danny Garcia in 2016 and Errol Spence in 2015. He’s not ranked among the top 10 at 147 pounds by either Ring Magazine or the Transnational Boxing Ranking Board, and will likely be a huge underdog once oddsmakers weigh in on the bout as the date nears. Vargas is exactly the kind of opponent a promoter seeks when looking for a bout for a 31-year-old fighter like Khan coming back from a career-threatening knockout. He’s just good enough for the promotion to be taken seriously but presents no real danger to Khan beyond lucky punches or injuries. “There are big names out there for me like Kell Brook and Manny Pacquiao. I want to be a champion again and want to fight Pacquiao. I have been chasing him a long time to get that fight. If winning this shows I want it more then it's all about him accepting that challenge." Either bout, should Khan defeat Vargas as expected, would be a huge promotion with career altering ramifications. Moreover, either of the proposed bouts would feature hugely talented prizefighters in each corner, both capable of winning the fight. A presumed welterweight battle with Pacquiao would happen only if Pacquiao defeats Matthysse first. While bookmakers currently list Pacquiao as the clear favorite, there are questions surrounding Pacquiao’s camp since the dismissal of longtime trainer Freddie Roach. Pacquiao is already 39 years old, and he’s coming off a controversial decision loss to Jeff Horn last year. As for Brook, the UK fighter is currently on the comeback route himself since suffering consecutive stoppage losses. The first came as a middleweight in Sept. 2016 to Gennady Golovkin, who himself is set to fight Alvarez later this year. The second came to Errol Spence at welterweight in May 2017. Brook is currently campaigning at junior middleweight and is scheduled to face Brandon Cook on July 28 in Greenwich. Brook defeated Siarhei Rabchanka by Round 2 knockout in March, and would probably seek a catchweight contract for the Khan bout somewhere near 150 pounds.